Have you ever found yourself stopped on the side of the road after hitting an owl with your car? Have you discovered a small bird on your deck, injured after running into your window? Perhaps you've witnesses a fox with a limp or a moose become entangled in barbed wire. Maybe you're worried about that baby hare that's been sitting in your yard for several hours or need advice on how to deter skunks. We have been helping people with these kinds of situations since 1984. Without a wildlife hospital to care for these injured animals, we will not be able to carry on in the same capacity. Your support not only helps the animals, but the people who find them. That person could be you! Medicine River Wildlife Centre is a registered charity that rescues, rehabilitates and releases Alberta's wildlife. Since 1984, we have been caring for injured, orphaned and compromised wild animals of all stripes. More than 2000 patients (over 200 different species) per year from baby birds to magnificent moose and everything in between have found help in our wildlife hospital. That adds up to a lot of wear and tear on the original building, built in 1991 for very low cost. We had the best of intentions to take the old building down to the bare bones and renovate it, but it was beyond hope. The ceiling is caving in, the building floods in heavy rains, the foundation doesn’t meet government codes and now the heating system no longer works. It will be easier, more cost effective and safer for patients, staff and volunteers to create a whole new building rather than try to rescue or rehabilitate the old one. It is time to “let it go” and begin anew. The new hospital will include new and improved intensive care units, quarantine room, patient receiving examination room and five intensive care units (ICUs). Much needed additions will include an oiled wildlife wash area, safe oil disposal, freezer room and larger education room. Built in power-washing, vacuum, and air exchange systems will offer a more safe and efficient facility. The new building will also be completely “green” with features such as solar assisted hot water heating and special “Glas Curtain” windows to name just a few. The new septic system uses no chemicals and results in water that is very close to drinkable. Build the best possible wildlife hospital for people to turn to when finding wild animals in need. Create an education centre like no other with up close wildlife encounters, facts and displays to bring people and wildlife together, and a warm, natural atmosphere that makes you feel a part of something big. Patients are brought to our Centre by members of the public who care deeply about their fellow creatures. The majority of the injuries we see are caused by human activities. Cars, windows, barbed wire, electrical wires, pet cats and dogs were not in Mother Nature’s plan for her wild children. The very strategy that protects babies in nature – mother leaving for long periods so as not to attract attention to their location - puts them at risk for accidental “kidnapping” by well-meaning humans. No matter how or why they arrive, our patients have one thing in common. No wallets or health insurance to pay their bills. They will not be contributing to the building fund, so we are turning to our fellow animal lovers for support. 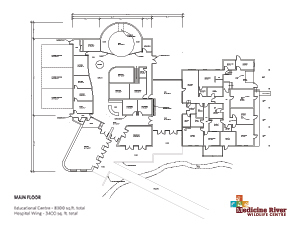 Construction has begun with plans to complete the hospital portion by early 2017. The building is worn out. The old PVC in-floor heating has collapsed, there is extensive damage to walls, and the building floods in heavy rains. To improve the energy efficiency, safety, and health of the buidling. To provide more space to operate. To allow for more efficient delivery of both hospital and educational programs. We at Medicine River Wildlife Centre are also very proud of our “out-of-the-box” thinking. We strive to seek out new and innovative ideas to better the field of wildlife rehabilitation and make the lives of their wild charges better. One of these innovations is the development and research of “fostering” orphaned wildlife back to wild families instead of captive raising and releasing. This method reduces costs, puts orphans back into normal families, and best of all, leaves staff the time to spend with the critically injured patients and education programs. Wildlife rehabilitation however is only part of our story. Every year we present formal education programs to schools, community groups, correctional institutions and seniors homes. We have also been hosting 12-15 international students every summer for the past 7 years. They help with the work while experiencing our unique Canadian landscape and wildlife up close. Other education programs take a wide range of forms from telephone calls and school work experience to events and one-on-one discussions. Once the hospital is complete, the next phase is to build a new public environmental education Centre to replace the present one which is currently acting as a temporary hospital. The sooner we complete this phase, the sooner you can see for yourself the remarkable and rewarding work that we do! Donate Now. "Facility Upgrade" will be pre-selected as your donation allocation. Come Grow With Us! Contributors of $300/sq ft will have a tree planted in their name. An engraved rock will be placed at the base for donations of $25,000 or more. Come up with a fundraising idea of your own! All donations will go directly to project. All money raised will be overseen by the accounting firm of ProVerus LLP in Red Deer, Alberta. Members of the public are welcome to see the financial records. THE PLACE TO MORTGAGE INC.
We have been building this charity from a small, backyard operation to a thriving and vital community service for over 30 years and we plan on making it even better over the next 30 years! We are no strangers to challenges but we like to approach them head on, with honesty, and out-of-the-box thinking. 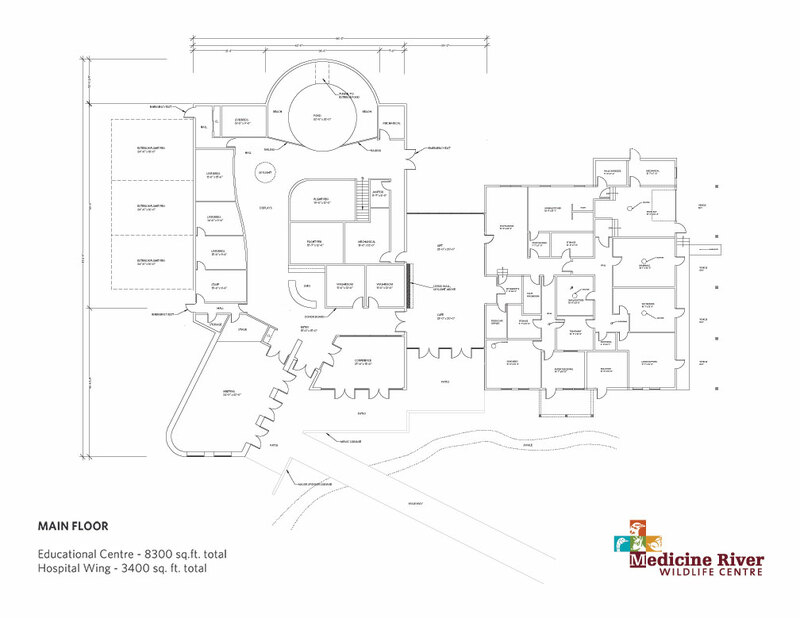 Complete facility plans and details are available upon request. Please contact us for further information. Thank you for your support!